Note: This interface does not support control of the SH-2000's after-touch value. 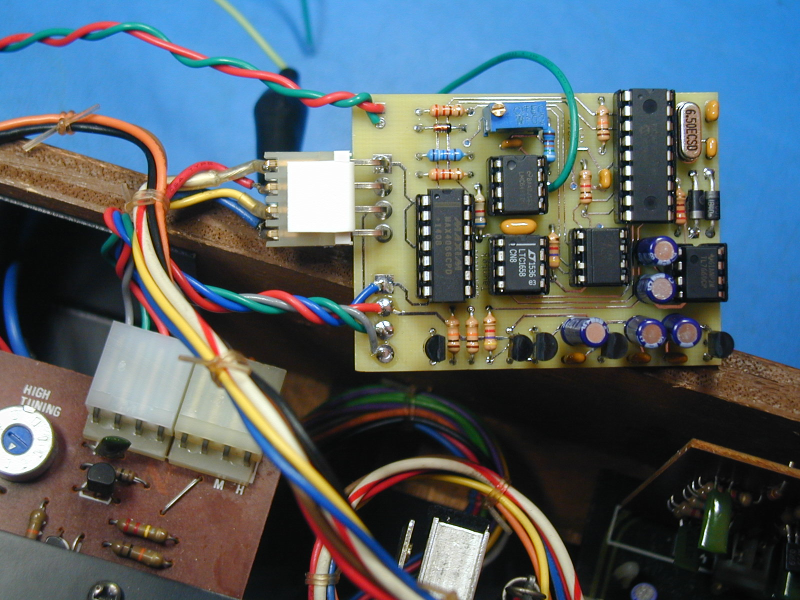 I used a PIC microcontroller to process the MIDI messages and control a 14-bit DAC. The interface needs to be able to generate CV's up to and including +15VDC, which is tough to do considering that the supplies in the SH-2000 are +/-15V. To address this, I regulated the +15V to get +9V, then used a voltage doubling chip to get approximately +18V. This is high enough to allow generation of CV's up to 15V as needed. A trimmer pot is used to set the correct DAC scaling for the SH-2000's oscillator. 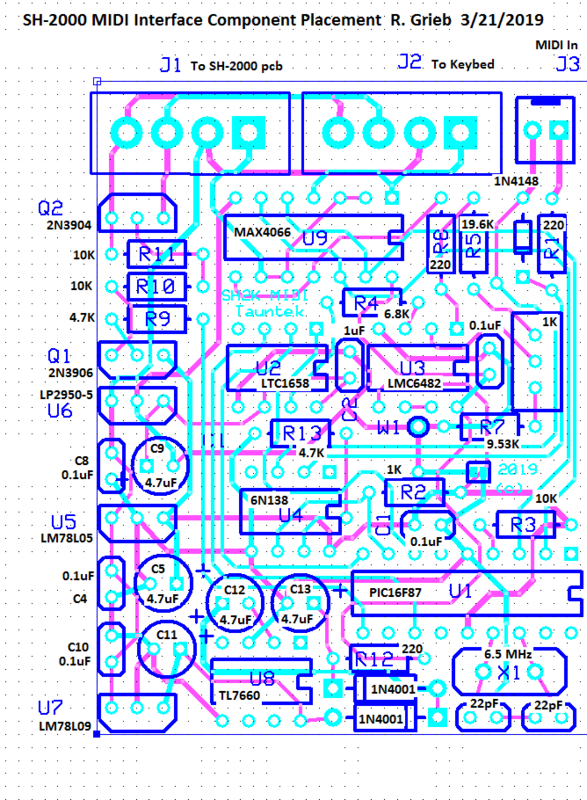 Here is the schematic of the interface, here is a parts list, and here is a component placement diagram for the pc board. The board was designed to sit vertically at the rear of the SH-2000, keeping the wires short. The internal keybed unplugs from the SH-2000 and plugs onto my interface. At power-up, the internal keybed is used. If a MIDI Note On message is received, the interface switches control to the DAC, and captures the MIDI channel, which is used until power is cycled. The 37-note MIDI range maps directly to the SH-2000 keys. The SH-2000 transpose switch is applied after the oscillator, and functions normally in MIDI mode. Please note: Taking an SH-2000 apart and modifying it must be done very carefully, or damage to the unit could result. It should only be attempted by someone familiar with this type of work. I will not be responsible for any damage to any unit caused by either proper or improper use of the design offered here.